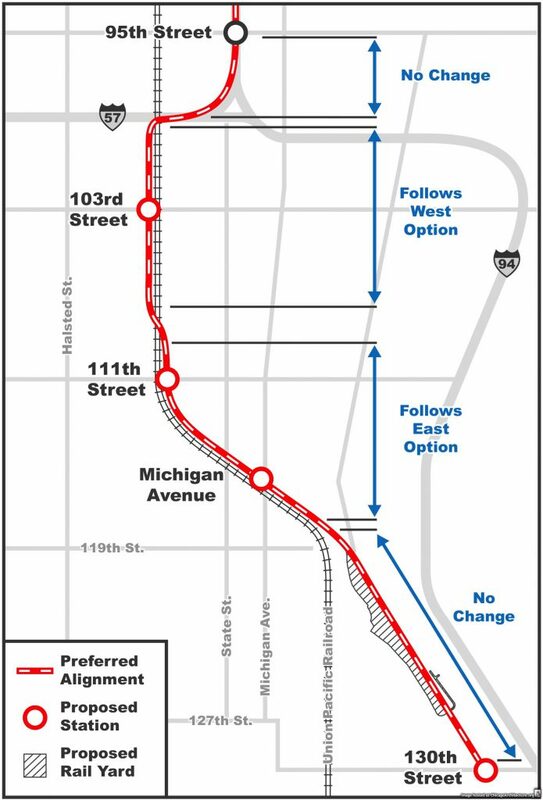 Planning for the long-promised southern extension of the Red Line to 130th Street took a step forward last week as the city chose a preferred route. Continue south to 130th Street. The proposed 5.3-mile extension would include four new stations near 103rd Street, 111th Street, Michigan Avenue and 130th Street. This project is decades in the making and has been touted as a priority by city officials for many years. The Far South Side is a transit desert and its isolation limits access to jobs, healthcare, recreation, educational opportunities and other critical services. It is exciting to see community input shape the future of this route. Unfortunately, funding for the extension remains a major hurdle. Typically, a combination of local and state funds covers 50 percent of the total project cost and the remaining amount comes from the federal government. The Chicago region currently lacks a local dedicated revenue stream to fund transit improvements and expansion, and there hasn’t been a state capital bill since 2009. When and if funding is secured for the Red Line Extension, the earliest construction could begin is 2022. Active Trans will continue to campaign for local and state elected officials aligning their budgets with their stated priority of making the Red Line Extension a reality. Active Trans also supports upgrading service and tracks on the nearby Metra Electric District Line, which could happen faster at a lower cost than the Red Line Extension. Both projects are needed to bring access and investment to these underserved communities. Join our advocacy supporters list to be alerted of future opportunities to voice your support for a local dedicated revenue stream for transit. You can also sign up for project alerts from the CTA. Email RedExtension@transitchicago.com to be contacted for future project updates and to share any feedback on the proposed route.